Wolf-Rayet (WR) stars produce powerful stellar winds and contribute chemical elements to the interstellar medium (ISM). They represent a phase in the evolution of very massive stars. Most are believed to be headed toward a Type 1b or 1c superova. Only 10% of WR stars have nebulosity surrounding them, referred to as a WR Ring Nebula (Esteban and Rosado, Astron. Astrophys. 304, 491-504, 1995). 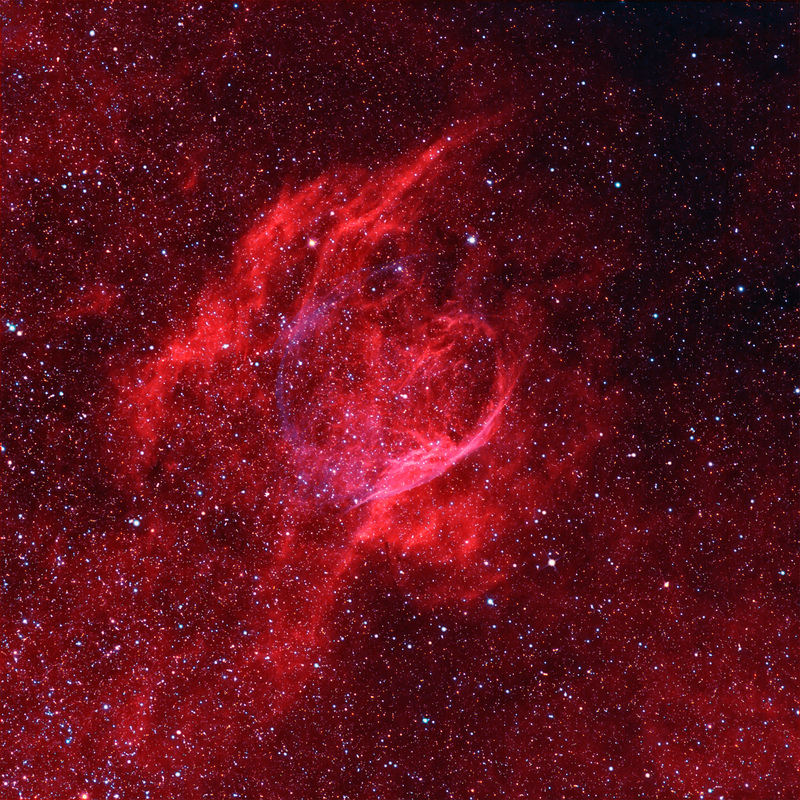 The Crescent Nebula (NGC 6888) in Cygnus is another well-known, often-imaged example. The nebulosity can be measured spectroscopically with large, professional telescopes to study how these supersonic winds interacted with the ISM. Other WR Ring Nebula are more difticult to detect. They are embedded in surrounding hydrogen nebulosity, as is the case forWR75/RCW104, which is similar to my image of WR134 in the northern constellation of Cygnus. SIMBAD identifies WR75 as HD 147419, which is the largest bright blue star near the center of the oval-shaped ring nebula. The image is ~ 36′ x 36′ and north is to the upper right. Contrast is brought out to highlight the elliptical shape of RCW104 using spectrally narrow 3 nm OIII and H-a narrowband filters. Natural star colors are added using data from RGB filters. The RA/DEC values provided below are for the center of the frame and not for the coordinates of WR75. A rough age estimate from Chu (Astrophysical Journal, Part 1, vol. 254, Mar. 15, 1982, p. 578-586) is 10,000 years.